Conni reusable swim shorts are designed to contain bladder and bowel matter. Our technology provides kids a safe, secure and confident aquatic experience when those unexpected accidents occur, delaying void-causing germs from leaking into the water. 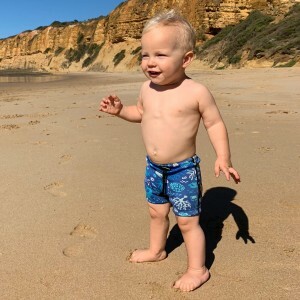 Flexible and comfortable with a built-in brief, Conni Infant Swim Shorts feature an adjustable drawstring with toggle at the waist for a secure fit. CONNI swim shorts are specifically designed to stop faecal matter from entering the water. The fabric used is impermeable, meaning that nothing will pass through it. It behaves similarly to a wetsuit that divers use except it is a lot softer, thinner and has more stretch. There is a toggle drawstring at the waist which should be pulled tight but comfortable.